There are over 3200 dams in North Carolina, and many of these are owned and maintained by smaller entities that may not have the resources to take care of the dams the way they need to be taken care of. And so after time, an inspection may show that the dam needs repair or replacement. Then, if the affected community doesn’t have (and can’t get) the legal structure or financial resources to rebuild, that community may come to the public entity for help. What factors might you consider in evaluating whether your local government wants to participate in a dam repair or replacement project? If these are privately owned dams and lakes, why should we care? Storm water and drainage. When you see a dam fail, you understand the importance of these man-made impoundments in flood control and other stormwater management. Property values and tax revenues. Often the lake front property carries a relatively high value. If the dam breaks, or if the regulators require the dam to be breached, the loss of the lake will eventually have a negative effect on property values and a corresponding negative effect on tax collections. Public health and safety. If the dam is damaged or otherwise in need of repair (but not yet breached), you have a realistic threat of damage to property and injury to people that could come with no warning. If the lakebed is essentially empty, it becomes a home for undesirable animals, a breeding ground for mosquitoes, and a harder-to-manage attractive nuisance. Now if none of these reasons applies to your situation, you can stop reading and move on to your next problem. By the way, we will refer to the local government as the “City” in this post, but the analysis is all but identical for counties. Do we have to own the dam for us to help? Not necessarily. Some of the easiest, most direct options will require the City to own the dam, but there are alternatives if the City doesn’t want to be in the dam-owning business. If you do own the dam, you would only need to own it for the term of the financing. You can set up a separate nonprofit corporation to own the dam for the financing term, although in that case the City would still be expected to make the loan payments. You might be able to leave the dam in the hands of its current owner and contract with that owner concerning the improvements, if you conclude that there is a sufficient public benefit to the dam work. If the City is not going to own the dam, then we recommend that the City build a substantial public record of the expected public benefits from the dam restoration – in other words, clearly explain why this work has a public benefit, and not only a benefit for the dam owners and those who live immediately on the impounded lake. Can we get the dam owner or property owners to help pay for this? Sure. How much they pay, and how direct that payment obligation might be, will depend in part on your financing choices. If a local government makes a decision to help a community rebuild or refurbish a dam, it has several ways to help. These alternatives have different elements of risk and effort for the locality and offer different political considerations for the governing body. 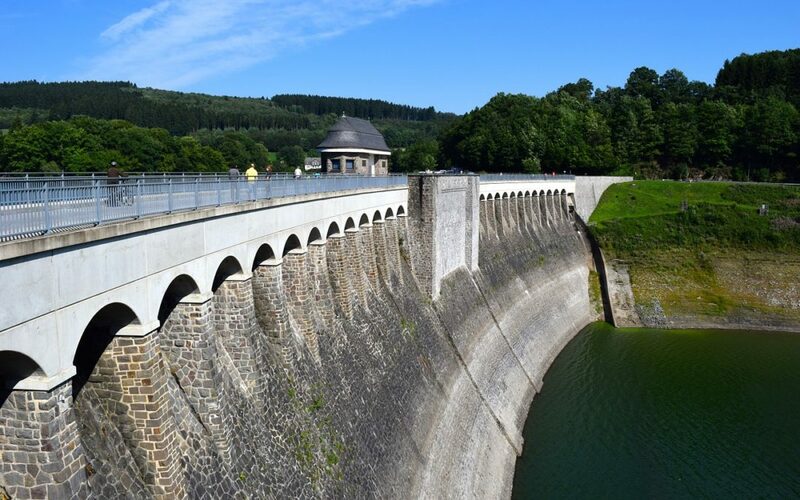 You will see that in some cases, the availability of a tool will be dependent on characterizing the dam and lake as actually important stormwater management assets, and in many cases these strategies can work together. Let’s start with ways to get the money in the first place, and then talk about how you get the benefitted property owners to pay for all or part of the project. Take ownership of the dam and pledge it as collateral for borrowed money. You might well find a bank that’s willing to lend you the money with only the dam as collateral under a standard North Carolina installment financing. For you to pledge the dam as collateral, of course, you need to own the dam. You can have an arrangement up front so that the dam more or less automatically goes back to its prior owners once the financing is paid, so that you don’t won’t have continuing responsibility for the dam. Add money for the dam project to some other installment financing. If you already have an installment financing planned for another project, see if the lender will let you add in money for the dam project without requiring additional collateral. That’s often a useful and economical approach for both the City and the lender, especially when the primary focus of the financing is of high importance to the City. Pay for it directly out of your own pocket. Always an option, I suppose. Use voter-approved general obligation bonds or “two-thirds” bonds that don’t require voter approval. Always an option, I suppose. Use revenue bonds backed by special assessments. In this case, the City would issue revenue bonds backed only by payments on special assessments levied against those benefitting directly from the dam improvements, usually meaning those who own property bordering on the lake. Now, how do you get the benefitted owners to pay for it? Traditional special assessments. The City can assess the benefitted property owners for the cost of the improvements. In this scenario, the City pays the project costs up front, and then collect payments from the property owners over time to repay the project cost (which can include interest on any money the City borrows for the project). The assessments can be assessed with up to a ten-year term for payment. The City can levy the assessments to recover project costs no matter how the City funds the work in the first place. Long-term “critical infrastructure” assessments. The City can extend the assessment repayment term to up to 30 years, if the City receives a petition from enough of the benefitted property owners (at least 50% of the owners representing at least 66% of the property value in the area to be assessed). Although these assessments were put into the statutes to form a source to back revenue bonds, you can nevertheless use this assessment technique without using revenue bonds. Cost-sharing agreement with property owners. It may be that the entity that owns the dam, or the neighboring property owners, are not able to pay all of the cost of the project on their own. You may nevertheless be willing to get a contractual promise from those other parties to pay some agreed-upon portion of the cost, even if you do not then reduce that promise to assessments. Special tax districts. The City can establish a municipal service district (under Chapter 160A, Article 23 of the General Statutes) and levy a supplemental tax on property within that district to pay for “drainage projects” and “watershed improvement projects,” which are defined to include projects and structures for flood prevention, drainage improvement, and related purposes. As noted above, in undertaking any project like this, it is important to build a factual record to demonstrate the broader public benefits that a project will achieve. There is a notice and hearing process to create a district, and a district in most cases may only come into effect on the July 1 following completion of the formation process – so it’s not too early to start planning if you have a project like this you want to consider. The authority and process for County Service Districts (Chapter 153A, Article 16) is substantially identical. In some circumstances you might want to have additional local legislation to address your authority for a particular arrangement. In at least one circumstance, a local government obtained local legislation (well technically it was statewide legislation of limited applicability, not much difference) to clarify its authority to levy special assessments for privately owned dam improvements. We know of another case in which the local government proceeded to levy assessments under the existing general law authority. With a long session of the General Assembly right around the corner, now is a good time to be thinking about this. As you examine your financing options, you may well find yourself having to balance what you can do quickly and cheaply, against what meets your local political circumstances. In our experience, staff of the Local Government Commission understands that the cheapest solution is not always the best solution; so, don’t be afraid to discuss your full range of options. At the same time, for a project like this, they’ll want to know you have a partner (whether a group or an individual) in the affected community that can help you navigate the process with all the affected parties. Some of the legal arrangements for dam repairs can leave it in the hands of the private owner to contract for design and construction of the dam improvements. There’s nothing wrong with such an arrangement, but we would always recommend to our local government clients that the construction arrangements include payment and performance bonds in favor of the local government, because the local government will of course have a strong interest in seeing that the work is completed. We’ve worked on at least three projects over the years where the point was to finance improvements to a dam. We’d love to talk to you about your project on a no-cost, no-obligations basis. Please see our disclaimer and click here to learn more about our Firm’s public finance practice.